Not to be confused with Mandatory Palestine and the Emirate of Transjordan, the territories administered under the terms of the Mandate for Palestine legal instrument. The Mandate for Palestine was a "Class A" League of Nations mandate for British rule over the territories of Palestine and Transjordan, both of which had been conceded by the Ottoman Empire following World War I. The Balfour Declaration's "national home for the Jewish people" was to be established in Palestine, and a separate Arab Emirate had been established in Transjordan; these policies had begun to be enacted shortly after the initial assignation of the mandate in April 1920. The mandate was formally in force between 29 September 1923 and 15 May 1948. UNOG Library; ref. : C.529. M.314. 1922. VI. The document was based on the principles contained in Article 22 of the Covenant of the League of Nations of 28 June 1919 and of the Supreme Council of the Principal Allied Powers' San Remo Resolution of 25 April 1920. The objective of the system of Class A mandates was to administer parts of the defunct Ottoman Empire, which had been in control of the Middle East since the 16th century, "until such time as they are able to stand alone". The approximate northern border with the French Mandate was agreed upon in the Paulet–Newcombe Agreement of 23 December 1920. Transjordan was added to the mandate following a March 1921 conference at which it was agreed that Abdullah bin Hussein would administer the territory under the auspices of the Palestine Mandate. After the war it had been administered from Damascus by a joint Arab-British military administration, headed by Abdullah's younger brother Faisal, who was subsequently proclaimed King. Transjordan became a no man's land after the French removed Faisal in the July 1920 Battle of Maysalun; during which period the British chose to avoid any definite connection with Palestine. This was given legal form on 21 March 1921 when the British introduced Article 25 into the Palestine Mandate, which included Transjordan within the scope and allowed the Mandatory there "to postpone or withhold application of such provisions of this mandate as he may consider inapplicable to the existing local conditions." On 16 September 1922, Article 25 was implemented via the Trans-Jordan memorandum, which established a separate "Administration of Trans-Jordan" for the application of the Mandate, under the general supervision of Great Britain. Transjordan became largely autonomous under British tutelage according to an agreement of 20 February 1928, and fully independent under a treaty with Britain of 22 March 1946. On 29 November 1947, the United Nations Partition Plan for Palestine was passed, envisaging the creation of separate Jewish and Arab states operating under economic union with Jerusalem being transferred to UN trusteeship. Two weeks later, Colonial Secretary Arthur Creech Jones announced that the British Mandate would terminate on 15 May 1948. On the last day of the Mandate, the creation of the State of Israel was proclaimed, and the 1948 Arab–Israeli War began. Palestine and Transjordan in a pre-World War I British government ethnographical map. Immediately following their declaration of war on the Ottoman Empire in November 1914, the British War Cabinet began to consider the future of Palestine, at the time an Ottoman region with a small minority Jewish population. By late 1917, in the lead up to the Balfour Declaration, the wider war had reached a stalemate, with two of Britain's allies not fully engaged: the United States had yet to suffer a casualty, and the Russians were in the midst of a revolution. A stalemate in southern Palestine was broken by the Battle of Beersheba on 31 October 1917. The release of the Balfour Declaration was authorised by 31 October; the preceding Cabinet discussion had referenced perceived propaganda benefits amongst the worldwide Jewish community for the Allied war effort. On 2 November 1917, during World War I, the British government issued the Declaration, a public statement announcing support for the establishment of a "national home for the Jewish people" in Palestine. The opening words of the declaration represented the first public expression of support for Zionism by a major political power. The term "national home" had no precedent in international law, and was intentionally vague as to whether a Jewish state was contemplated. The intended boundaries of Palestine were not specified, and the British government later confirmed that the words "in Palestine" meant that the Jewish national home was not intended to cover all of Palestine. The second half of the declaration was added to satisfy opponents of the policy, who had claimed that it would otherwise prejudice the position of the local population of Palestine and encourage antisemitism worldwide by "stamping the Jews as strangers in their native lands". The declaration called for safeguarding the civil and religious rights for the Palestinian Arabs, who composed the vast majority of the local population, and also the rights of the Jewish communities in other countries outside of Palestine. Controversy remains over a number of areas, such as whether the declaration contradicted earlier promises the British made to the Sharif of Mecca in the McMahon–Hussein correspondence, as well as the Sykes-Picot Agreement. The mandate system was established under Article 22 of the Covenant of the League of Nations, entered into on 28 June 1919 as the first twenty-six articles of the Treaty of Versailles. The mandates were to act as legal instruments containing the internationally agreed-upon terms for administering certain post-World War I territories on behalf of the League of Nations. These were of the nature of both a treaty and a constitution, which contained minority rights clauses that provided for the rights of petition and adjudication by the International Court. Article 22 was written two months before the signing of the peace treaty, before it was known what communities, peoples, or territories were related to sub-paragraphs 4, 5, and 6. The treaty was signed, and the peace conference had been adjourned, before a formal decision was made. Two governing principles formed the core of the Mandate System, being non-annexation of the territory and its administration as a "sacred trust of civilisation" to develop the territory for the benefit of its native people. The mandates were fundamentally different from the protectorates in that the Mandatory power undertook obligations to the inhabitants of the territory and to the League of Nations. The process of establishing the mandates consisted of two phases: the formal removal of sovereignty of the state previously controlling the territory, followed by the transfer of mandatory powers to individual states among the Allied Powers. Three steps were required to establish a mandate: "(1) The Principal Allied and Associated Powers confer a mandate on one of their number or on a third power; (2) the principal powers officially notify the council of the League of Nations that a certain power has been appointed mandatory for such a certain defined territory; and (3) the council of the League of Nations takes official cognisance of the appointment of the mandatory power and informs the latter that it [the council] considers it as invested with the mandate, and at the same time notifies it of the terms of the mandate, after ascertaining whether they are in conformance with the provisions of the covenant." According to the Council of the League of Nations, meeting of August 1920: "draft mandates adopted by the Allied and Associated Powers would not be definitive until they had been considered and approved by the League ... the legal title held by the mandatory Power must be a double one: one conferred by the Principal Powers and the other conferred by the League of Nations." January 1919 Foreign Office memorandum setting out the borders of Palestine, for the Eastern Committee of the British War Cabinet, ahead of the Paris Peace Conference. Emir Faisal's delegation submitted memoranda to the Paris peace Conference a statement to the Peace Conference on 1 January 1919 and a further memorandum on 29 January. They referred to the goal to "unite the Arabs eventually into one nation", defining the Arab areas as "from a line Alexandretta – Persia southward to the Indian Ocean" (1 January) or "from the line Alexandretta – Diarbekr southward to the Indian Ocean" (29 January). The second memorandum described boundaries of any new states as "matters for arrangement between us, after the wishes of their respective inhabitants have been ascertained" in a reference to US President Woodrow Wilson's policy of self determination.. In his presentation of 6 February 1919 to the Peace Conference, Faisal, speaking on behalf of King Hussein, asked for Arab independence, or at minimum the right to pick the mandatory. In the end, he recommended an Arab state under a British mandate. The World Zionist Organization (WZO) also asked for a British mandate, and asserted the 'historic title of the Jewish people to Palestine'. A confidential appendix to the report of the 1919 King-Crane Commission observed that "The Jews are distinctly for Britain as mandatory power, because of the Balfour declaration' and that the French 'resent the payment by the English to the Emir Faisal of a large monthly subsidy, which they claim covers a multitude of bribes, and enables the British to stand off and show clean hands while Arab agents do dirty work in their interest. "[non-primary source needed] The Faisal-Weizmann Agreement called for British mediation of any disputes. It also called for the establishment of borders, after the Versailles peace conference, by a commission to be formed for the purpose. The WZO later submitted to the peace conference a proposed map of the territory that did not include the area east of the Hedjaz Railway, including most of Transjordan. At the Paris Peace Conference, Prime Minister Lloyd George told Georges Clemenceau and the other allies that the McMahon-Hussein correspondence was a treaty obligation. He explained that the agreement with Hussein had actually been the basis for the Sykes-Picot Agreement, and that the French could not use the proposed League Of Nations Mandate system to break the terms of the agreement. He pointed out that the French had agreed not to occupy the area of the independent Arab state, or confederation of states, with their military forces, including the areas of Damascus, Homs, Hama, and Aleppo. British Foreign Secretary Arthur Balfour (later Lord Balfour) and U.S. President Woodrow Wilson were present at the meeting. The preamble of the Mandate document states that the Mandate is granted to Britain "for the purpose of giving effect to the provisions of Article 22 of the Covenant of the League of Nations". That article, which concerns entrusting "tutelage" of colonies formerly under German and Turkish sovereignty to "advanced nations" with specific regard to "[c]ommunities formerly belonging to the Turkish Empire" that they "have reached a stage of development where their existence as independent nations can be provisionally recognised subject to the rendering of administrative advice and assistance by a Mandatory until such time as they are able to stand alone." Throughout the period of the Mandate, Palestinian Arab leaders cited this as proving their assertion that the British were obliged under the terms of the Mandate to facilitate the eventual creation of an independent Arab state in Palestine. The open negotiations began at the Paris Peace Conference, continued at the Conference of London and took definite shape only after the San Remo conference in April 1920. There the Allied Supreme Council granted the mandates for Palestine and Mesopotamia to Britain, and those for Syria and Lebanon to France. In August 1920, this was officially acknowledged in the Treaty of Sèvres. The San Remo conference assigned the mandate for Palestine to the United Kingdom under Article 22 of the Covenant of the League of Nations. The Allies also decided to make the UK responsible for putting into effect its own Balfour Declaration of 1917. France required the continuation of its religious protectorate in Palestine but Italy and Great Britain opposed it. France lost the religious protectorate but thanks to the Holy See continued to enjoy liturgical honors in Mandatory Palestine until 1924 when the honours were abolished. The draft mandate, published at Cmd. 1176, was submitted by Lord Balfour, then Lord President of the Council, on 7 December 1920 to the Secretariat General of the League of Nations for the approval of the Council of the League of Nations.. The changes between December 1920 and July 1922 were primarily focused on protection of the Holy Places (Articles 14 and 21) and the addition of Transjordan (Article 25). A second draft was presented on 10 June 1920. In the second draft, the paragraph recognising the historical connection of the Jewish people with Palestine was removed from the preamble. "self-governing commonwealth" was replaced by "self-governing institutions". Also, "The recognition of the establishment of the Jewish National Home as the guiding principle in the execution of the Mandate" was omitted from the first draft. After strenuous objection to the proposed changes, the statement regarding the historical connections of the Jews with Palestine was re-incorporated into the Mandate in December 1920. The draft was submitted to the League of Nations on 6 December 1920. In the summer of 1921, a Palestinian delegation arrived in London to negotiate on behalf of the Muslim and Christian population. [c] The document was based on the principles contained in Article 22 of the draft Covenant of the League of Nations and the San Remo Resolution of 25 April 1920 by the principal Allied and associated powers after the First World War. The mandate formalised British rule in the southern part of Ottoman Syria from 1923–1948. Each of the principal Allied powers had a hand in drafting the proposed mandate—although some, including the United States, had not declared war on the Ottoman Empire and did not become members of the League of Nations. The United States was not a member of the League of Nations. On 23 February 1921, two months after the draft mandates had been submitted to the League, the United States formally requested that it be allowed to comment prior to consideration by the Council of the League of Nations; the Council agreed to this requirement a week later. These discussions did not conclude until 14 May 1922, when the United States government announced the terms of an agreement with the United Kingdom regarding the Palestine mandate. The terms included a stipulation that "consent of the United States shall be obtained before any alteration is made in the text of the mandate". On 3 December 1924, it entered into a bilateral treaty with Britain in the Palestine Mandate Convention, in which the United States "consents to the administration" (Article 1) and which dealt with eight issues of concern to the United States such as property rights and business interests. [the] Mandates were not the creation of the League, and they could not in substance be altered by the League. The League's duties were confined to seeing that the specific and detailed terms of the mandates were in accordance with the decisions taken by the Allied and Associated Powers, and that in carrying out these mandates the Mandatory Powers should be under the supervision—not under the control—of the League. A mandate was a self-imposed limitation by the conquerors on the sovereignty which they exercised over the conquered territory. Turkey was not a member of the League of Nations at the time of the negotiations; having been on the losing side of World War I, they were not to join until 1932. The decisions regarding mandates over Ottoman territory taken by the Allied Supreme Council at the San Remo conference was documented in the Treaty of Sèvres, signed on behalf of the Ottoman Empire and Allies on 10 August 1920. However, the treaty was never ratified by the Ottoman government, because it required the agreement of Mustafa Kemal Atatürk. Atatürk expressed disdain for the treaty, and continued the fight known as the Turkish War of Independence. In November 1922, the Conference of Lausanne began, with the intention to negotiate a treaty to replace the failed Treaty of Sèvres. In the Treaty of Lausanne, signed on 24 July 1923, the Turkish government formally recognised the detachment of the regions south of the frontier agreed in the Treaty of Ankara (1921), thereby making a general renunciation of its sovereignty over Palestine. "Zionist Rejoicings. British Mandate For Palestine Welcomed", The Times, Monday, 26 April 1920, following conclusion of the San Remo conference. Whereas the Principal Allied Powers have also agreed that the Mandatory should be responsible for putting into effect the declaration originally made on November 2nd, 1917, by the Government of His Britannic Majesty, and adopted by the said Powers, in favour of the establishment in Palestine of a national home for the Jewish people, it being clearly understood that nothing should be done which might prejudice the civil and religious rights of existing non-Jewish communities in Palestine, or the rights and political status enjoyed by Jews in any other country. Article 4 of the Mandate provided for "the recognition of an appropriate Jewish agency as a public body for the purpose of advising and co-operating with the Administration of Palestine in such economic, social and other matters as may affect the establishment of the Jewish National Home and the interests of the Jewish population of Palestine," effectively establishing the Jewish Agency. Article 7 provided: "The Administration of Palestine shall be responsible for enacting a nationality law. There shall be included in this law provisions framed so as to facilitate the acquisition of Palestinian citizenship by Jews who take up their permanent residence in Palestine." The Vatican and the Italian and French governments concentrated their efforts on the issue of the Holy Places and rights of the Christian communities; the Zionists showed limited interest in this area. continued to press their own legal claims on the basis of the former Protectorate of the Holy See and the French Protectorate of Jerusalem. The Catholic powers saw an opportunity to reverse the gains made by the Greek and Russian Orthodox communities in the region over the previous 150 years, as documented in the Status quo of Holy Land sites. Britain was to assume responsibility for the Holy Places under Article 13 of the mandate. The idea of an International Commission to resolve claims on the Holy Places had been formalised in Article 95 of the Treaty of Sèvres, and taken up again in article 14 of the Palestinian Mandate. Negotiations concerning the formation and the role of the commission were partly responsible for the delay in ratifying the mandate. Article 14 of the Mandate required Britain to establish a commission to study, define, and determine the rights and claims relating to the different religious communities in Palestine. This provision, which called for the creation of a commission to review the religious Status Quo between the religious communities, was never implemented. Article 15 required the mandatory administration to see to it that complete freedom of conscience and the free exercise of all forms of worship were permitted. Article 15 stated that "No discrimination of any kind shall be made between the inhabitants of Palestine on the ground of race, religion or language. No person shall be excluded from Palestine on the sole ground of his religious belief." The High Commissioner established the authority of the Orthodox Rabbinate over the members of the Jewish community and retained a modified version of the old Ottoman Millet system. Formal recognition was extended to eleven religious communities, which did not include the non-Orthodox Jewish or Protestant Christian denominations. The proviso to the objective of the mandate was that "nothing should be done which might prejudice the civil and religious rights of existing non-Jewish communities in Palestine". 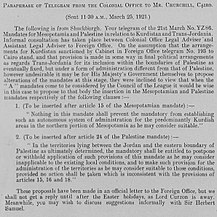 12 March 1921 British memorandum explaining the situation of Transjordan: "His Majesty's Government have been entrusted with the Mandate for "Palestine." If they wish to assert their claim to Trans-Jordan and to avoid raising with other Powers the legal status of that area, they can only do so by proceeding upon the assumption that Trans-Jordan forms part of the area covered by the Palestine Mandate. In default of this assumption Trans-Jordan would be left, under article 132 of the Treaty of Sèvres, to the disposal of the principal Allied Powers." 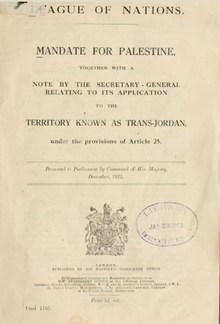 Between 12–25 March 1921, the inclusion of Transjordan in the mandate was formulated by the British Government. Under the terms of the 1915 McMahon-Hussein correspondence and the 1916 Sykes-Picot agreements, Transjordan was to be part of an Arab state or confederation of Arab states. In spring 1918, the British military retreated from Trans-Jordan after their first and second attacks on the territory, in an indication of their political ideas about the future of the territory; they had intended the area to become part of an Arab Syrian state. [xii] The British subsequently defeated the Ottoman forces in Transjordan in late September 1918, just a few weeks before the Ottoman Empire's overall surrender. 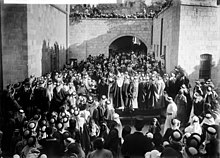 Herbert Samuel's proclamation in Salt, on 21 August 1920 in the courtyard of the Assumption of Our Lady Catholic Church. Samuel was admonished a few days later by Curzon, who instructed that: "There must be no question of setting up any British administration in that area". Curzon wrote in February 1921: "I am very concerned about Transjordania... Sir H.Samuel wants it as an annex of Palestine and an outlet for the Jews. Here I am against him." Distinction to be drawn between Palestine and Trans-Jordan under the Mandate. His Majesty's Government are responsible under the terms of the Mandate for establishing in Palestine a national home for the Jewish people. They are also pledged by the assurances given to the Sherif of Mecca in 1915 to recognise and support the independence of the Arabs in those portions of the (Turkish) vilayet of Damascus in which they are free to act without detriment to French interests. The western boundary of the Turkish vilayet of Damascus before the war was the River Jordan. Palestine and Trans-Jordan do not, therefore, stand upon quite the same footing. At the same time, the two areas are economically interdependent, and their development must be considered as a single problem. Further, His Majesty's Government have been entrusted with the Mandate for "Palestine." If they wish to assert their claim to Trans-Jordan and to avoid raising with other Powers the legal status of that area, they can only do so by proceeding upon the assumption that Trans-Jordan forms part of the area covered by the Palestine Mandate. In default of this assumption Trans-Jordan would be left, under article 132 of the Treaty of Sèvres, to the disposal of the principal Allied Powers. Some means must be found of giving effect in Trans-Jordan to the terms of the Mandate consistently with "recognition and support of the independence of the Arabs". "In the territories lying between the Jordan [river] and the eastern boundary of Palestine as ultimately determined, the Mandatory shall be entitled, with the consent of the Council of the League of Nations, to postpone or withhold application of such provisions of this mandate as he may consider inapplicable to the existing local conditions, and to make such provision for the administration of the territories as he may consider suitable to those conditions"
Trans-Jordania would not be included in the present administrative system of Palestine, and therefore the Zionist clauses of the mandate would not apply. Hebrew would not be made an official language in Trans-Jordania and the local Government would not be expected to adopt any measures to promote Jewish immigration and colonisation. "There have been several complaints here that the political situation has not been dealt with with sufficient clarity, that the Mandate and boundaries questions were not mentioned. The Mandate is published and can now not be altered with one exception, which l will now explain. Transjordania, which in the first draft of the Mandate lay outside the scope of the Mandate, is now included. Article 25 of the Mandate which now lies before the League of Nations, contains this provision. Therewith, Mr. de Lieme, the question of the eastern boundaries is answered. The question will be still better answered when Cisjordania is so full that it overflows to Transjordania. The northern boundary is still unsatisfactory. We have made all representations, we have brought all the arguments to bear and the British Government has done everything in this connection. We have not received what we sought, and I regret to have to tell you this. The only thing we received was the concession to be allowed a voice in the discussion on the water rights. And now just a week ago, when the Administration in Palestine, under pressure from a few soldiers, wished to alter our boundaries we protested most strongly and confirmed the boundary along the lines that were agreed upon. That is not satisfactory, but with the forces at our disposal nothing else could be attained. So it is with the Mandate." "The Congress notes with satisfaction that Transjordania, which the Jewish people has always regarded as an integral part of Erez Israel, is to be again incorporated into the mandated territory of Palestine. The Congress deplores that the question of the northern boundary of Erez Israel, despite all the efforts of the Executive, has not yet received a satisfactory solution." Excerpts relating to Transjordan's inclusion in the Mandate from a September 1921 from the 12th Zionist Congress, the first following the Balfour Declaration. Article 25 was presented as a Zionist victory, despite its intention to exclude Transjordan from the Jewish National Home, which was not then public. Abdullah's six-month trial was subsequently extended, and by the following summer Abdullah had begun to voice his impatience at the lack of formal confirmation. [xxiii] Shortly after the approval of the mandate in July 1922, the Colonial Office prepared a memorandum to give effect to Article 25. [xxiv] On 16 September 1922, the League of Nations approved a British memorandum detailing its intended implementation of that clause, namely to exclude Transjordan from the articles related to Jewish settlement. 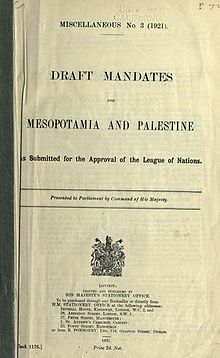 On submission of the memorandum to the Council of the League of Nations, Balfour explained the background as recorded in the minutes: "Lord Balfour reminded his colleagues that Article 25 of the mandate for Palestine as approved by the Council in London on July 24th, 1922, provides that the territories in Palestine which lie east of the Jordan should be under a somewhat different regime from the rest of Palestine. ... The British Government now merely proposed to carry out this article. It had always been part of the policy contemplated by the League and accepted by the British Government, and the latter now desired to carry it into effect. In pursuance of the policy, embodied in Article 25, Lord Balfour invited the Council to pass a series of resolutions which modified the mandate as regards those territories. The object of these resolutions was to withdraw from Trans-Jordania the special provisions which were intended to provide a national home for the Jews west of the Jordan." The legality of the mandate has been disputed in detail by scholars, in particular with respect to its consistency with Article 22 of the Covenant of the League of Nations. Prior to the war, the territory which became Mandatory Palestine formerly constituted the Ottoman Empire divisionss of the Mutasarrifate of Jerusalem and the southern part of the Beirut Vilayet, whilst what became Transjordan was made up of the southern part of the Vilayet of Syria and the northern part of the Hejaz Vilayet. During the war the British military divided the Hijaz theatre of war and the EEF theatre of war along a line from a point south of Akaba to a point south of Ma'an. The EEF theatre was divided between its main theatre in Palestine, led directly by the EEF, and the Syrian theatre, including Transjordan, led by the Arab Revolt army of Faisal. The post-war military administrations, OETA South and OETA East, the latter with an Arab governor, split the territory in the same way; Professor Yitzhak Gil-Har notes that "the military administration always treated Trans-Jordan as a separate administration outside its jurisdiction". Professor Uri Ra'anan, commenting in 1955, stated that the OETA system of borders "politically, if not legally, was bound to influence the post-war settlement". The determination of Palestine's northern border was a far longer and more complex process than for Palestine's other borders. The two primary differences were that this border separated Britain and France and that it ran through heavily populated areas which had not previously been separated – the other borders separated British Palestine from British Egypt and British Transjordan, and ran primarily through sparsely inhabited areas. The Northern boundary between the British and French mandates was defined in broad terms by the Franco-British Boundary Agreement of December 1920. That agreement placed the bulk of the Golan Heights in the French sphere. The treaty also established a joint commission to settle the precise border and mark it on the ground. The commission submitted its final report on 3 February 1922, and it was approved with some caveats by the British and French governments on 7 March 1923, several months before Britain and France assumed their Mandatory responsibilities on 29 September 1923. Under the treaty, Syrian and Lebanese residents would have the same fishing and navigation rights on Lake Hula, Lake Tiberias, and the Jordan River as citizens of the Palestine Mandate, but the government of Palestine would be responsible for policing of the lakes. The Zionist movement pressured the French and British to include as much water sources as possible to Palestine during the demarcating negotiations. These constant demands influenced the negotiators and finally led to the inclusion of the whole Sea of Galilee, both sides of the Jordan river, Lake Hula, Dan spring, and part of the Yarmouk. As High Commissioner of Palestine, Herbert Samuel had demanded full control of the Sea of Galilee. The new border followed a 10-meter wide strip along the northeastern shore. Following the settlement of the Northern border issue, the British and French governments signed on 2 February 1926 an Agreement of good neighbourly Relations between the mandated territories of Palestine, Syria and Lebanon. The Jordan river was chosen as the border between the two territories; this was documented in the 1922 Transjordan memorandum. The future Transjordan had been part of the Syrian administrative unit under the Ottomans. It was part of the captured territory placed under the Allied Occupied Enemy Territory Administration (OETA). In August 1919, Balfour stated that he wanted Palestine to be defined to include some of the lands lying east of the Jordan, but not the Hedjaz Railway. At the 1919 Paris Peace Conference, the British officials presented a proposal including maps showing the eastern boundary of Palestine located just 10 km east of the Jordan. [xxviii] At the Peace Conference, the Zionist Organization's claims did also not include any territory east of the Hedjaz Railway. The railway ran parallel with and about 35–40 miles (about 60 km) east of the Jordan river. The Faisal-Weizmann Agreement, never implemented, included a provision that the boundaries between the Arab state and Palestine should be determined by a commission after the Paris Peace Conference. The territory east of the Jordan between Damascus and Ma'an had been ruled as part of Faisal's Kingdom of Syria since the end of the war. The British were content with that arrangement because Faisal was a British ally, the region fell within the indirect sphere of British influence according to the Sykes-Picot agreement, and they didn't have enough troops to garrison the territory. The first border on which agreement was reached was with British-ruled Egypt. On 9 May 1919, a memorandum of the British political delegation to the Paris peace conference stated that the British intended to adopt the border line established between Egypt and the Ottoman Empire in 1906. The decision represented a compromise between the proposals by the Zionists and the British authorities in Egypt, and was already well defined on maps. The Negev was added to Palestine on 10 July 1922, having been conceded by British representative John Philby "in Trans-Jordan's name". [xxix] Abdullah made a request for the Negev to be added to Transjordan in late 1922, and again in 1925, but this was rejected. The Southern border between Transjordan and Arabia was left undefined whilst Abdullah's father remained in power in the Kingdom of Hejaz. However, following the 1924-25 Saudi conquest of Hejaz, the Hashemite army fled to the northern Ma'an province of Hejaz, which was then annexed by Transjordan. This was formalised by the Hadda Agreement, with the resulting zig-zag border becoming known as Winston's Hiccup. The location of the Eastern border between Transjordan and Iraq was first set out on 2 December 1922, in a treaty to which Transjordan was not party to – the Uqair Protocol between Iraq and Nejd. It described the western end of the Iraq-Nejd boundary as "the Jebel Anazan situated in the neighbourhood of the intersection of latitude 32 degrees north longitude 39 degrees east where the Iraq-Najd boundary terminated", thereby implicitly confirming this as the point at which the Iraq-Nejd boundary became the Transjordan-Nejd boundary. This followed a proposal from Lawrence in January 1922 that Transjordan be extended to include Wadi Sirhan as far south as al-Jauf, in order to protect Britain's route to India and contain Ibn Saud. Transjordan became largely autonomous under British tutelage according to an agreement of 20 February 1928, and fully independent under a treaty with Britain of 22 March 1946. On 29 November 1947, the United Nations Partition Plan for Palestine was passed, envisaging the creation of separate Jewish and Arab states operating under economic union with Jerusalem being transferred to UN trusteeship. Two weeks later, Colonial Secretary Arthur Creech Jones announced that the British Mandate would terminate on 15 May 1948. [n] On the last day of the Mandate, the creation of the State of Israel was proclaimed, and the 1948 Arab–Israeli War began. 11-26 Aug Curzon policy: "no question of setting up any British administration in the area"
^ In July, Balfour had authorized Mr. Forbes Adam of the Foreign Office, who at that time served with the Peace Delegation in Paris, to discuss with Dr. Weizmann, Mr. Frankfurter (as he than was) and Mr. Ganz the draft for the Palestine Mandate "on the supposition that Great Britain were to obtain the mandate for Palestine". ^ Weizmann wrote in his memoirs: "Curzon had by now taken over from Balfour at the Foreign Office, and was in charge of the actual drafting of the Mandate. On our side we had the valuable assistance of Ben V. Cohen, who stayed on with us in London after most of his fellow-Brandeisists had resigned from the Executive and withdrawn from the work. Ben Cohen was one of the ablest draftsmen in America, and he and Curzon's secretary — young Eric Forbes-Adam, highly intelligent, efficient and most sympathetic — fought the battle of the Mandate for many months." ^ Weizmann wrote in his memoirs: "As the drafting of the Mandate progressed, and the prospect of its ratification drew nearer, we found ourselves on the defensive against attacks from every conceivable quarter — on our position in Palestine, on our work there, on our good faith. The spearhead of these attacks was an Arab delegation from Palestine, which arrived in London via Cairo, Rome and Paris in the summer of 1921, and established itself in London at the Hotel Cecil." 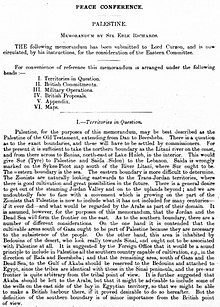 ^ Nineteenth Session of the Council, Twelfth Meeting, St James' Palace, London on July 22nd, 1922, at 3:30p.m: "The Council decided that the mandate for Palestine was approved with the revised text of Article 14, and that the mandate for Syria would come automatically into force as soon as the negotiations between the French and Italian Governments had resulted in a final agreement. It was further understood that the two mandates should, come into force simultaneously." ^ Nineteenth Session of the Council, Thirteenth Meeting, St James' Palace, London on July 24th, 1922, at 3.p.m: "In view of the declarations which have just been made, and of the agreement reached by all the Members of the Council, the articles of the mandates for Palestine and Syria are approved. The mandates will enter into force automatically and at the same time, as soon as the Governments of France and Italy have notified the President of the Council of the League of Nations that they have reached an agreement on certain particular points in regard to the latter of these mandates." ^ At a private meeting of the Council of the LoN on 29 September 1923, the minutes stated: "M. SALANDRA stated, on behalf of his Government, that a complete agreement had been reached between the Governments of France and Italy on the subject of the mandate for Syria. There was therefore nothing to prevent the immediate entry into force of the mandate for Palestine. M. HANOTAUX, on behalf of his Government, confirmed M. Salandra's statement and pointed out that in view of this agreement the Council's resolution of July 24th, 1922, would come into operation and the mandates for Palestine and Syria would enter into force automatically and at the same time. Sir Rennell RODD expressed his satisfaction that, this question had been finally settled. The COUNCIL noted that, in view of the agreement between the Governments of France and Italy in respect of the mandate for Syria, the mandates for Palestine and Syria would now enter into force automatically and at the same time." ^ Weizmann wrote in his memoirs: "The most serious difficulty arose in connection with a paragraph in the Preamble — the phrase which now reads: 'Recognizing the historical connection of the Jews with Palestine.' Zionists wanted to have it read: 'Recognizing the historic rights of the Jews to Palestine.' But Curzon would have none of it, remarking dryly: 'If you word it like that, I can see Weizmann coming to me every other day and saying he has a right to do this, that or the other in Palestine! I won't have it!' As a compromise, Balfour suggested 'historical connection,' and 'historical connection' it was. I confess that for me this was the most important part of the Mandate. I felt instinctively that the other provisions of the Mandate might remain a dead letter, e.g, ' to place the country under such political, economic and administrative conditions as may facilitate the development of the Jewish National Home.' All one can say about that point, after more than twenty-five years, is that at least Palestine has not so far been placed under a legislative council with an Arab majority — but that is rather a negative brand of fulfilment of a positive injunction." ^ Bentwich described the situation as follows: "The High Commissioner had ... only been in office a few days when Emir Faisal ... had to flee his kingdom" and "The departure of Faisal and the breaking up of the Emirate of Syria left the territory on the east side of Jordan in a puzzling state of detachment. It was for a time no-man's-land. In the Ottoman regime the territory was attached to the Vilayet of Damascus; under the Military Administration it had been treated a part of the eastern occupied territory which was governed from Damascus; but it was now impossible that that subordination should continue, and its natural attachment was with Palestine. The territory was, indeed, included in the Mandated territory of Palestine, but difficult issues were involved as to application there of the clauses of the Mandate concerning the jewish National Home. The undertakings given to the Arabs as to the autonomous Arab region included the territory. Lastly, His Majesty's Government were unwilling to embark on any definite commitment, and vetoed any entry into the territory by the troops. The Arabs were therefore left to work out their destiny." ^ Hubert Young to Ambassador Hardinge (Paris), 27 July 1920, FO 371/5254, cited by Wilson. ^ Curzon wrote: "His Majesty's Government are already treating 'Trans-Jordania' as separate from the Damascus State, while at the same time avoiding any definite connection between it and Palestine, thus leaving the way open for the establishment there, should it become advisable, of some form of independent Arab government, perhaps by arrangement with King Hussein or other Arab chiefs concerned." ^ The British Foreign Office confirmed the position in 1946, in discussions over the independence of Transjordan, stating that "the clauses of the Palestine Mandate relating to the establishment of a Jewish national home were, with the approval of the League of Nations, never applied in Transjordan. His Majesty's Government have therefore never considered themselves under any obligation to apply them there"
^ Lloyd-George's "Aide-Memoire in Regard to the Occupation of Syria, Palestine and Mesopotamia Pending the Decision in Regard to Mandates" included the following: "1. Steps will be taken immediately to prepare for the evacuation by the British Army of Syria and Cilicia including the Taurus tunnel. 2. Notice is given both to the French Government and to the Emir Feisal of our intentions to commence the evacuation of Syria and Cilicia on November 1, 1919... ...6. The territories occupied by British troops will then be Palestine, defined in accordance with its ancient boundaries of Dan to Beersheba." ^ Creech Jones stated to the House of Commons: "Before the conclusion of the discussions, Sir Alexander Cadogan announced on behalf of the Government that the withdrawal of our Forces and administration would be effected by 1st August, 1948... It will be appreciated that the mandatory responsibility for government in Palestine cannot be relinquished piecemeal. The whole complex of governmental responsibilities must be relinquished by the Mandatory Government for the whole of Palestine on an appointed day. As I have indicated, once our military withdrawal is properly under way, the forces necessary for exercising this responsibility will no longer be adequately available, and it will not, therefore, be possible to retain full mandatory responsibility after a certain date. The Mandate will, therefore, be terminated some time in advance of the completion of the withdrawal, and the date we have in mind for this, subject to negotiation with the United Nations Commission, is 15th May. ^ Pappé suggests that the French concessions were made to guarantee British support for French aims at the post-war peace conference concerning Germany and Europe. ^ a b Quigley wrote: "The provision on Palestine thus read differently from the provision on Syria and Mesopotamia and omitted reference to any provisional recognition of Palestine as an independent state. The provision on Palestine read differently for the apparent reason that the mandatory would administer, hence the thrust of the provision was to make that point clear. In any event, the understanding of the resolution was that all the Class A mandates were states. Before leaving San Remo, Curzon telegraphed a memorandum to the Foreign Office in London to explain the San Remo decisions. In explaining to the Foreign Office how the boundaries between the mandate territories would he fixed, Curzon wrote that "[t]he boundaries of these States will not be included in the Peace Treaty [with Turkey] but are also to be determined by the principal Allied Powers."" ^ McTague writes: "Since the British army under General Edmund Allenby had conquered the Holy Land, and since the British announcement of the Balfour Declaration had demonstrated her keen interest in the future of the country, it was a foregone conclusion that the Allies would have to acquiesce in her control of Palestine." ^ McTague writes: "The Zionist Organization had produced a draft of a proposed constitution as far back as December 1918 in anticipation of their appearance before the Versailles Conference... The Zionists presented this document to the Peace Conference, but since the Allies failed to come to any decisions on the captured Ottoman territories, these proposals were not discussed at the time. Nevertheless, in April the Foreign Office reviewed the Zionist Organization's draft, and they made some small but significant changes... Then in July, Foreign Secretary Balfour authorized Eric Forbes-Adam to begin direct negotiations with members of the Zionist Organization, including Weizmann and Felix Frankfurter, over the wording of the text. The Foreign Office unveiled a much longer document (twenty-nine articles compared to five in the earlier draft), but one which adhered quite closely to the general principles laid down in April." ^ McTague writes: "The final draft of the mandate, then, was the result of long months of argument, discussion and compromise. After negotiations between Forbes-Adam and Cohen, a version had emerged which embodied the major Zionist objectives, but under the prodding of Curzon, a much less specific document had evolved by the time the next draft had been produced in June. By then, the Zionists had become dissatisfied, and they had succeeded in having the key phrase on "historical connection" restored to the document in early August. The interdepartmental Committee had cut the phrase in half at the end of the month, and Curzon had decided to eliminate it altogether in September. Pressure from Lloyd George and Balfour, however, had induced him to compromise, and the final draft had included a Preamble with which Weizmann was quite satisfied. Aside from the Preamble, Curzon had had his own way almost entirely. The Zionist Organization was mentioned only once, in Article 4, and even there its role was qualified by the phrase .. so long as its organisation and constitution are in the opinion of the Mandatory appropriate." General reference to a Jewish Agency was made only three times, in Articles 4, 6 and 11, and all guarantees, such as those for freedom of religion and rights of education, were made only in general terms, without any specific reference to Jews. It should be noted that some further changes were made in the mandate before its approval in 1922, but these revisions were undertaken at the behest of other sovereign states, not the Zionists." ^ McTague writes: "Yet another interesting aspect is the complete absence of any input from Arab sources, despite the fact that the Jerusalem Riot of April 1920 had testified to Palestinian resistance to the National Home policy. No effort was made by the government to bring any Arabs into the negotiations. Largely motivated by traditional imperialistic beliefs, His Majesty's government reasoned that having conquered Palestine by force of arms, they could do with it as they wished. The only Arab leader in whom they had any confidence at all, Emir Feisal, had already agreed to the principle of Jewish National Home under certain conditions, and during the course of the year 1920 his problems in Syria precluded his involvement in the mandate discussions. His Majesty's government also refused to recognize any Palestinians as spokesmen for their own community, although a year later they were forced to grant unofficial status to the delegation from the Palestine Arab Congress. Thus, the mandate was drafted and redrafted several times over, without the Palestinian Arabs having had any input as to its contents." ^ Cassels explained that: "Mussolini himself was reduced to a policy of pinpricks. In the new year 1923, Fascist Italy sought to embarrass the Anglo-French mandate-holders at the League of Nations by championing the rights of native petitioners in the mandated territories. Furthermore, by aligning with the United States, Italy was instrumental in delaying the full implementation of the Near Eastern mandates. However, in April, when Washington modified its opposition, Mussolini recognized that conditions were "unfavorable to the possibility of continuing resistance alone." As a final gesture he required a guarantee of the rights of Italian citizens in the mandated areas. This took the summer of 1923 to negotiate, but on September 30 Italy agreed to support at Geneva a resolution ratifying the authority of Britain and France in their Near Eastern mandates. Although he had totally given in, Mussolini was the last to admit it. With his acceptance of the Anglo-French mandates went the stipulation that it was "not prejudicial to the re-examination of the general question concerning Allied reciprocity in the eastern Mediterranean"." ^ Quincy Wright explained this as follows: "On July 22 the Italian representative expressed his willingness to confirm the Palestine and Syrian mandates under reservation of certain assurances from France. Difficulties then arose over the clause of the Palestine mandate with regard to holy places but finally agree ment was reached through the simple expedient of omitting all men tion of the organization of the commission in control of this matter. Public announcement of the confirmation of the Syrian and Palestine mandates was made on July 24 by Viviani who said the amount of secrecy indulged in was not dangerous because "sooner or later the Council had to give an account of its proceedings." Balfour followed with a plea for reconciliation between the Arabs and Jews in Pales tine. Thus through an adroit threat of publicity, the support of disinterested members of the Council and an appeal to the prestige of the League, Lord Balfour had induced Italy to withdraw from her obstructive position. League diplomacy had been successful. ^ Quincy Wright explained this as follows: "The terms of the Palestine mandate were objected to by the papacy on May 23, 1922, as giving too great privileges to the Jews who had been promised a "national home" in that region, by the Balfour declaration of November 2, 1917, by various Moslem organizations for the same reason, by several Jewish organizations as limiting the privileges of the Jews too much, and by the British House of Lords as contrary to the wishes of the majority of the inhabitants of Palestine. The British announced agreement with the United States on the terms of this mandate in May, 1922. The United States approved the French draft of the Syrian mandate in July, 1922, but Italy objected to its confirmation, as also that of Palestine, until title was cleared through ratification of a peace treaty with Turkey. Apparently she also objected because the failure of the treaty of Sèvres had deprived her of the spheres of interest which she had been accorded in compensation for her approval of the French and British spheres by the agreement of August 10, 1920, dependent on that treaty. Italy apparently wished a renewal of the assurances with regard to economic, educational and missionary privileges in Syria and Palestine which she had renounced in the sphere of interest agreement. Great Britain had already given assurances to Italy with regard to Palestine, and during the council meeting in July, 1922, Italy and France began negotiations with the result that the Syrian and Palestine mandates were confirmed with assurances that Catholic and Moslem interests in Palestine would be protected, on July 24, to go into effect when the Franco-Italian agreement was announced. This announcement was made on September 29, 1923, the peace treaty with Turkey having been signed at Lausanne on July 24, 1923." ^ As Marlowe described: "It was formally approved by the League of Nations on 24 July 1922, but did not come legally into force until after the ratification of the Treaty of Lausanne on 28 September 1923." ^ Klieman writes: "Accordingly, Churchill cabled the Colonial Office on 21 March, asking whether the Cairo proposals would necessitate any special provisions being made in the two mandates... Upon receipt of this cable informal consultation took place between the Colonial Office legal adviser and the assistant legal adviser to the Foreign Office. Their suggestion, on the 25th by Shuckburgh, was that... a clause be inserted in each of the mandates... [Footnote:] The first draft of Article 25 was originally worded "to postpone the application of such provisions," but was altered at Shuckburgh's initiative since "'postpone' means, or may be taken to mean, that we are going to apply them eventually""
^ Biger wrote: "The British representatives involved in the Middle Eastern issue - Mark Sykes and Ormsby-Gore - both supported a line East of the Jordan river, but not all the way up the mountains. The retreat of the British forces from Trans-Jordan in the spring of 1918 was only a military move, although it indicated British political ideas about the future of the region East of the rift. According to their position, the land that lay east of the Jordan river was destined to be part of the Arab Syrian state, which would be centred in Damascus and headed by Faisal." ^ Paris writes: "Of course, the uncertainty surrounding Transjordan's status pre-dated Abdullah's appearance on the scene. While it had long been clear that British control of the area south of the Sykes-Picot line and extending from Palestine to Persia would be divided into two political regions, the Palestine and Mesopotamian Mandates were assumed to be coterminous: no provision was made for any intervening territory. Whether it was part of Palestine or Mesopotamia, however, there was never any doubt that Transjordan would come under the British Mandate. But recognition of that fact did not resolve the status of Transjordan vis-à-vis its neighbours in any definitive way. Moreover, two principles that emerged in 1920 and were calculated to further define the nature of the new state, served only to further confuse matters and to generate the uncertainty of which Abdullah, Samuel and Philby later complained. The first was that the administrative authority of the Palestine government would not be extended east of the Jordan, a principle laid down as early as July 1920. The second sprang from Young's interpretation of the 'McMahon pledge'. Since McMahon had excluded from the area of promised Arab independence territory lying west of the 'district of Damascus', he argued that in areas to the east of that district—that is, east of the River Jordan—Britain was obligated to 'recognise and support' such independence. The interpretation seemed logical enough to those who had not examined carefully the text of McMahon's letters…"
^ Wilson writes: "Since the end of the war the territory north of Ma'an had been ruled by Damascus as a province of Faysal's Kingdom of Syria. Although it fell within the British zone according to the Sykes-Picot agreement, Britain was content with the arrangement because it favoured Arab rule in the interior and Faysal was, after all, British protege. However, when France occupied Damascus the picture changed dramatically. Britain did not want to see France extend its control southward to the borders of Palestine and closer to the Suez Canal.... It suddenly became important to know 'what is the "Syria" for which the French received a mandate at San Remo?' and 'does it include Transjordania?'... The British foreign secretary, Lord Curzon, decided that it did not and that Britain henceforth would regard the area as independent, but in 'closest relation' with Palestine." ^ Sicker wrote: "On August 7, 1920, Herbert Samuel, the recently appointed high commissioner in Palestine, cabled London requesting permission to include Trans-Jordan directly under his administrative control, thereby allowing him to take the necessary steps to restore order in the territory. This would eliminate the threat of a French attempt to control the region from Damascus." ^ Wilson writes: "Samuel then organised a meeting of Transjordanian leaders at Salt on 21 August, at which he would announce British plans... On 20 August Samuel and a few political officers left Jerusalem by car, headed for the Jordan river, the frontier of British territory at that time. 'It is an entirely irregular proceeding,' he noted, 'my going outside my own jurisdiction into a country which was Faisal's, and is still being administered by the Damascus Government, now under French influence. But it is equally irregular for a government under French influence to be exercising functions in territory which is agreed to be within the British sphere: and of the two irregularities I prefer mine.'... The meeting, held in the courtyard of the Catholic church, was attended by about 600 people..... Sentence by sentence his speech describing British policy was translated into Arabic: political officers would be stationed in towns to help organise local governments; Transjordan would not come under Palestinian administration; there would be no conscription and no disarmament......On balance, Samuel's statement of policy was unobjectionable. Three things feared by the Arabs of Transjordan – conscription, disarmament, and annexation by Palestine - were abjured.... The presence of a few British agents, unsupported by troops, seemed a small concession in return for the protection Britain's presence would afford against the French, who, it was feared, might press their occupation southward... Samuel returned to Jerusalem well pleased with the success of his mission. He left behind several officers to see to the administration of Transjordan and the maintenance of British influence." ^ Wilson writes: "Abdullah's arrival in Ma'an on 21 November threatened to disrupt Samuel's cosy arrangement. According to reports, Abdullah had a force of 300 men and six machine guns." ^ a b Wasserstein writes: "Palestine, therefore, was not partitioned in 1921–1922. Transjordan was not excised but, on the contrary, added to the mandatory area. Zionism was barred from seeking to expand there – but the Balfour Declaration had never previously applied to the area east of the Jordan. Why is this important? Because the myth of Palestine's 'first partition' has become part of the concept of 'Greater Israel' and of the ideology of Jabotinsky's Revisionist movement." ^ Klieman writes: "In an urgent letter to the Foreign Office on 24 March, the Colonial Office explained that Article 25 had been framed in such a way as to enable Britain "to set up an Arab administration and to withhold indefinitely the application of those clauses of the mandate which relate to the establishment of the National Home for the Jews""
^ Wilson writes: "Abdullah began by suggesting the unification of Palestine and Transjordan under an Arab ruler, or the unification of Transjordan and Iraq. Both ideas were firmly squashed. In the end he agreed to take responsibility for Transjordan alone for a period of six months. .........It was further agreed that no British troops would be stationed there... With this agreement, the division of the Fertile Crescent into separate states dominated by either Britain or France was completed. Despite the short term nature of the arrangement, Transjordan proved to be a lasting creation. For Abdullah himself his six months lasted a life time." ^ William Roger Louis wrote: In return for providing a rudimentary administration and obviating the need for British military occupation, Abdullah in March 1921 gained assurance from Churchhill, then Colonial Secretary, that no Jews would be allowed to settle in Transjordan. That guarantee effectively created Transjordan as an Arab country apart from Palestine, where the British commitment to a 'national home' remained a delicate problem between Abdullah and the British. ^ Paris writes: "Churchill's decision to prolong British sponsorship of Abdullah did little to elevate the low opinion that Whitehall entertained for the Amir… It was the attitude in Jerusalem—Amman's only conduit to London—that critically affected Abdullah's regime, and this attitude underwent a dramatic change in 1922. Samuel and Deedes, the harshest critics of the Amir in 1921, became his strongest supporters by mid-1922. 'If we lose the cordial co- operation of Abdullah,' Samuel wrote in August, 'we lose our most valuable asset in Trans-Jordan. '… Although the Amir had won the support of Samuel and conditions in Transjordan had improved considerably in 1922, neither the status of the territory, nor that of Abdullah within it, had yet been defined. When Churchill decided to continue British support for the Amir in late 1921, he also stated his preference to simply 'allow matters...to pursue their present course' in Transjordan. But Samuel and Philby found such a laissez-faire policy difficult to accept. And by July, Abdullah too 'was getting very sick of the present situation of uncertainty' and told Philby 'he could not go on much longer'… These problems were highlighted by the amorphous nature of the territory: as of July 1922, only Transjordan's northern boundary had been defined. ^ Paris writes: "Owing to US and Vatican opposition, the Palestine Mandate was not approved by the League of Nations until 22 July 1922. Shortly thereafter, the Colonial Office prepared a memorandum describing those provisions of the Palestine Mandate that would not be applied to Transjordan, as allowed by Article 25. The memorandum was then presented to the Council of the League, which passed a resolution on 16 September 1922 exempting Transjordan from the Zionist clauses of the Mandate.… Still, frustratingly for Abdullah, no formal steps had been taken to confirm a Sherifian solution for Transjordan and his role there remained undefined." ^ Adam Garfinkle explained that: "After the Cairo Conference of March 1921, whereupon the Emirate of Transjordan was created, Article 25 pertaining to Transjordan was added to the draft Mandate - in August 1921. Article 25 notes that Transjordanian territory is not included in the Jewish National Home. This language confuses some readers into imagining that Transjordanian territory was covered by the conditions of the Mandate as to the Jewish National Home before August 1921. Not so; what became Transjordanian territory was not part of the mandate at all. As noted, it was part of the Arabian Chapter problem; it was, in other words, in a state of postwar legal and administrative limbo. And this is also not to speak of the fact that, as of August 1921, the mandates had yet to be approved or take effect." ^ Biger wrote: "The results of the Cairo conference were a failure for the Zionist Organization, but Britain had won itself a devoted ally east of the Jordan... Certain Zionist politicians, and especially the circles that surrounded Ze'ev Jabutinski, regarded the British decisions and the quiet Zionist approval as treason. The call 'Two banks for the Jordan river – this one is ours and so is the other' was heard from then onward. Even the other side of the Jewish political map did not lose its faith in achieving a better political solution, and in a famous song – which was composed many years later – one can find the words 'from Metulla to the Negev, from the sea to the desert'. The allusion is clearly to the desert that lies east of the Trans-Jordanian heights and not to the Judean desert." ^ Biger noted that "The Arabs of Palestine, and the Arabs of the neighbouring countries, were not involved with the delimitation process of Palestine." ^ Biger wrote: "When the Paris Peace Conference was assembled, the British delegation presented an official proposal, based on maps, for the future border line of Palestine. On those maps the eastern boundary was located about 10 km east of the Jordan river, in a series of parallel lines." ^ Biger described this meeting as follows: "Sovereignty over the Arava, from the south of the Dead Sea to Aqaba, was also discussed. Philby agreed, in Trans-Jordan's name, to give up the western bank of Wadi Arava (and thus all of the Negev area). Nevertheless, a precise borderline was still not determined along the territories of Palestine and Trans-Jordan. Philby's relinquishment of the Negev was necessary, because the future of this area was uncertain. In a discussion regarding the southern boundary, the Egyptian aspiration to acquire the Negev area was presented. On the other hand the southern part of Palestine belonged, according to one of the versions, to the sanjak (district) of Ma'an within the vilayet (province) of Hejaz. King Hussein of Hijaz demanded to receive this area after claiming that a transfer action, to add it to the vilayet of Syria (A-Sham) was supposed to be done in 1908. It is not clear whether this action was completed. Philby claimed that Emir Abdullah had his father's permission to negotiate over the future of the sanjak of Ma'an, which was actually ruled by him, and that he could therefore 'afford to concede' the area west of the Arava in favour of Palestine. This concession was made following British pressure and against the background of the demands of the Zionist Organization for direct contact between Palestine and the Red Sea. It led to the inclusion of the Negev triangle in Palestine's territory, although this area was not considered as part of the country in the many centuries that preceded the British occupation." ^ Reid 2011, p. 115. ^ Quigley 1990, p. 10. ^ Friedman 1973, p. 282. ^ Zieger 2001, pp. 91, 97-98, 188–189. ^ Gelvin 2014, pp. 82–83. ^ Hurewitz 1979, pp. 102-106. ^ Lebow 1968, p. 501. ^ Caplan 2011, p. 78: "...becoming the first major power..."
^ a b Gelvin 2014, p. 82ff. ^ Biger 2004, p. 49. ^ Friedman 1973, p. 257. ^ Renton 2016, p. 21. ^ Caplan 2011, p. 74. ^ Lieshout 2016, p. 214. ^ Schneer 2010, p. 336. ^ Huneidi 2001, p. 66-72. ^ "BBC NEWS - UK - Lawrence's Mid-East map on show". ^ "Legal Consequences for States of the Continued Presence of South Africa in Namibia (South West Africa) notwithstanding Security Council Resolution 276 (1970)" (PDF). International Court of Justice: 28–32. 21 June 1971. Archived from the original (PDF) on 6 January 2015. Retrieved 28 August 2010. ^ Matz, 2005, p.70-71, "Primarily, two elements formed the core of the Mandate System, the principle of non-annexation of the territory on the one hand and its administration as a "sacred trust of civilisation" on the other... The principle of administration as a "sacred trust of civilisation" was designed to prevent a practice of imperial exploitation of the mandated territory in contrast to former colonial habits. Instead, the Mandatory's administration should assist in developing the territory for the well-being of its native people." ^ Wright 1930, p. 110–111. ^ See also: Temperley, History of the Paris Peace Conference, Vol VI, pp. 505–506; League of Nations, The Mandates System (official publication of 1945); Hill, Mandates, Dependencies and Trusteeship, pp. 133ff. ^ Wright 1930, p. 110. ^ a b Beshara 2012, p. 265. ^ Lieshout 2016, p. 323. ^ Council of Ten 1919, p. 899. ^ "DESIRES OF HEDJAZ STIR PARIS CRITICS; Arab Kingdom's Aspirations Clash with French Aims in Asia Minor. PRINCE BEFORE CONFERENCE Feisal's Presentation of His Case will Probably Be Referred to a Special Committee. England Suggested as Mandatory". ^ "Statement of the Zionist Organization regarding Palestine, 3 February 1919". Archived from the original on 12 February 2007. ^ "King-Crane Commission Report: Confidential Appendix". ^ Hughes 2013, p. 122. ^ Pappé 1994, pp. 3–5. ^ Council of Four 1919, p. 1-10. ^ Kattan 2009, p. 109-111. ^ a b c d Biger 2004, p. 173. ^ "San Remo Convention - World War I Document Archive". ^ Quigley 2010, p. 29. ^ 'Zionist Aspirations: Dr Weizmann on the Future of Palestine', The Times, Saturday, 8 May 1920, p.15. ^ a b McTague 1980, p. 282. ^ Woodward 1952, p. 428. ^ a b c McTague 1980, p. 283. ^ McTague 1980, p. 289. ^ McTague 1980, p. 290. ^ Weizmann 1949, p. 347–348. ^ a b c Sicker 1999, pp. 163-165. ^ a b Weizmann 1949, p. 348. ^ a b c Palestine Royal Commission 1937. ^ Ingrams 2009, p. Chapter 9, Drafting the Mandate. ^ a b Stoyanovsky 1928, p. 30. ^ Hansard, PALESTINE (ANGLO-AMERICAN AGREEMENT), HC Deb 16 May 1922 vol 154 c209: "...communiqué on this subject issued by the Department of State at Washington on 14th May"
^ Chamberlain 1924, p. 212-222. ^ "Text of the agreement". Archived from the original on 26 September 2012. Retrieved 18 February 2012. ^ Date on which the question of the Draft Mandate for Palestine should be placed on the Agenda of the Council, League of Nations, Official Journal, June 1922, pp. 545-546. ^ a b c McTague 1980, p. 281. ^ Klieman 1987, p. 85. ^ The Times, July 25, p9. ^ Cassels 1970, p. 31–32. ^ Wright 1930, p. 59. ^ "Minutes of Meeting of Council held at Geneva on 29 September 1923". League of Nations Official Journal. 4: 1355. 1923. ^ The Times, Oct 1, p11. ^ Wright 1930, p. 57. ^ LoN OJ minutes, Volume III, page 799; Italian representative: "the future of these mandates should be bound up with the fate of the Treaty of Sèvres". ^ Marlowe 1959, p. 62. ^ a b Rifkind, Simon Hirsch (1 January 1977). "The Basic Equities of the Palestine Problem". Arno Press – via Google Books. ^ "The Avalon Project : The Palestine Mandate". ^ Ingrams 2009, p. 98. ^ Ingrams 2009, p. 98–103. ^ Zander 1973, p. 12. ^ Zander 1973, p. 11-12. ^ Zander 1973, p. 12-14. ^ Nicault, Catherine (30 March 1999). "The End of the French Religious Protectorate in Jerusalem (1918-1924)" (4): 77–92 – via bcrfj.revues.org. ^ Hurewitz 1979, p. 308. ^ Klieman 1970, p. 115–125. ^ a b Klieman 1970, p. 123. ^ Klieman 1970, p. 115. ^ Hughes 2013, p. 71–88. ^ a b Biger 2004, p. 170. ^ Hughes 2013, p. 88. ^ Paris 2003, p. 154. ^ Paris 2003, p. 202-203. ^ Bentwich 1932, p. 51. ^ a b c Wilson 1990, p. 44. ^ a b c Paris 2003, p. 156. ^ a b Friedman 2011, p. 325. ^ a b Woodward 1963, p. 344. ^ Aruri 1972, p. 17; cites: Telegram from Earl Curzon to Sir Herbert Samuel, dated 6 August 1920. ^ Woodward 1963, p. 331. ^ Aruri 1972, p. 18; cites: Telegram 7 August 1920. ^ Woodward 1963, p. 334. ^ a b Sicker 1999, pp. 158. ^ Aruri 1972, p. 18. ^ Wilson 1990, p. 46–48. ^ Karsh & Karsh 2001, p. 317. ^ Woodward 1963, p. 351. ^ Paris 2003, p. 155; cites Curzon note to Lindsay, 12 February 1921, FO 371/6371, p. 128. ^ Wilson 1990, p. 48. ^ Sicker 1999, pp. 159-161. ^ Wasserstein 2008, p. 105–106. ^ Klieman 1987, p. 115. ^ Klieman 1970, pp. 228–234. ^ 1946 Aide-Memoire from "The British Embassy to the Department of State"
^ Paris 2003, p. 203. ^ Ingrams 2009, p. 116–117. ^ Ian Lustick (1988). For the Land and the Lord: Jewish Fundamentalism in Israel. Council on Foreign Relations. p. 37. ISBN 0-87609-036-6. ^ Wilson 1990, p. 53. ^ Louis 1985, p. 348. ^ Karsh & Karsh 2001, p. 322. ^ Zionist Organization 1922, p. 69. ^ Zionist Organization 1922, p. 149. ^ Paris 2003, p. 198-202. ^ Paris 2003, p. 203; Paris references Churchill to Hankey, Cabinet, 1 September 1922, FO 371/7791, pp. 180–2. ^ Pappé 2004, p. 84. ^ League of Nations Official Journal, Nov. 1922, pp. 1188–1189. ^ Biger 2004, p. 179. ^ Sykes 1973, p. 43. ^ Gil-Har 2000, p. 68; Gil-Har cites General W. Robertson, Chief Imperial General Staff, War Office, to General Officer Commanding in Chief, British Forces Egypt, 21 Feb. 1917. FO 882/16..
^ a b c d Gil-Har 2000, p. 69. ^ Frischwasser-Ra'anan 1955, p. 95. ^ Lieshout 2016, p. 373. ^ The Council of Heads of Delegations 1919, p. 216. ^ Biger 2004, p. 229. ^ Biger 2004, p. 101. ^ Biger 2004, p. 101-102. ^ Agreement between His Majesty's Government and the French Government respecting the Boundary Line between Syria and Palestine from the Mediterranean to El Hámmé, Treaty Series No. 13 (1923), Cmd. 1910. Also Louis, 1969, p. 90. ^ FSU Law Archived 16 September 2006 at the Wayback Machine. ^ Biger 2004, p. 130. ^ Biger 2004, p. 145, 150. ^ Text in League of Nations Treaty Series, vol. 56, pp. 80–87. ^ Paris 2003, p. 203; Paris references the correspondence which developed the boundaries: Samuel to CO, 27 and 30 August and 2 September 1922, FO 371/7791, pp. 169, 171, and 177; CO to Samuel, 28 and 30 August 1922, ibid., pp. 170, 174..
^ Aruri 1972, p. 17. ^ "The Near East". s.n. 1 January 1916 – via Google Books. ^ Sicker 1999, p. 145. ^ Biger 2004, p. 80. ^ a b Biger 2004, p. 94. ^ Biger 2004, p. 181; Biger references 10 July 1922 meeting notes, file 2.179, CZA. ^ Biger 2004, p. 184. ^ Wilson 1990, p. 100. ^ a b Amadouny 2012, p. 132-133. ^ Amadouny 2012, p. 132-133; Amadouny cites Lawrence, 'Transjordan-Extension of Territory', 5 January 1922, CO 733 33. ^ Wright 1951, pp. 439–460. ^ Jones 2016, p. 296. ^ Gil-Har 2000, p. 68. ^ a b c d Gil-Har 2000, p. 70. Amadouny, Vartan (2012). "The Evolution of the Transjordan-Iraq Boundary, 1915–40". In Clive H. Schofield and Richard N. Schofield (ed.). The Middle East and North Africa: World Boundaries. Routledge. ISBN 978-1-134-88028-7. Alsberg, Avraham P. (1980). "Delimitation of the eastern border of Palestine". Zionism. 2. Institute for Zionist Research Founded in Memory of Chaim Weizmann. pp. 87–98. doi:10.1080/13531048108575800. Aruri, Naseer Hasan (1972). Jordan: A Study in Political Development 1923–1965. The Hague: Martinus Nijhoff Publishers. ISBN 978-90-247-1217-5. Retrieved 2 May 2009. Biger, Gideon (2004). The Boundaries of Modern Palestine, 1840-1947. Routledge. ISBN 978-1-135-76652-8. Cassels, Alan (1970). Mussolini's Early Diplomacy. Princeton University Press. ISBN 978-1-4008-7234-3. Garfinkle, Adam (1998). "History and Peace: Revisiting two Zionist myths". Israel Affairs. 5 (1). Gil-Har, Yitzhak (2000). "Boundaries Delimitation: Palestine and Transjordan". Middle Eastern Studies. 36 (1): 68–81. Hughes, Matthew (2013). Allenby and British Strategy in the Middle East, 1917-1919. Routledge. ISBN 978-1-136-32395-9. Ingrams, Doreen (2009). Palestine papers: 1917–1922: seeds of conflict. Eland. ISBN 978-1-906011-38-3. Jones, Martin (6 October 2016). Failure in Palestine: British and United States Policy After the Second World War. Bloomsbury Academic. ISBN 978-1-4742-9127-9. Karsh, Efraim; Karsh, Inari (2001). Empires of the Sand: The Struggle for Mastery in the Middle East, 1789-1923. Harvard University Press. ISBN 978-0-674-00541-9. Kattan, Victor (June 2009). From coexistence to conquest: international law and the origins of the Arab-Israeli conflict, 1891–1949. Pluto Press. ISBN 978-0-7453-2579-8. Klieman, Aaron S. (1970). Foundations of British policy in the Arab world: the Cairo Conference of 1921. Johns Hopkins Press. Klieman, Aaron S. (1987). The Rise of Israel: Zionist Political Activity in the 1920s and 1930s. Garland Pub. ISBN 978-0-8240-4917-1. Lieshout, Robert H. (2016). Britain and the Arab Middle East: World War I and its Aftermath. I.B.Tauris. ISBN 978-1-78453-583-4. Louis, William Roger (1969). "The United Kingdom and the Beginning of the Mandates System, 1919–1922". International Organization. University of Wisconsin Press. 23 (1): 73–96. JSTOR 2705765. Louis, William Roger (1985). The British Empire in the Middle East, 1945-1951. Retrieved 26 February 2012. Marlowe, John (1959). The Seat of Pilate: An Account of the Palestine Mandate. Cresset Press. McTague, John J. (1980). "Zionist-British Negotiations over the Draft Mandate for Palestine, 1920". Jewish Social Studies. Indiana University Press. 42 (3/4): 281–292. JSTOR 4467095. Pappé, Ilan (2004). A History of Modern Palestine: One Land, Two Peoples. Cambridge University Press. ISBN 0-521-55632-5. Pappé, Ilan (15 August 1994). "Introduction". The Making of the Arab–Israeli Conflict, 1947–1951. I.B.Tauris. ISBN 978-1-85043-819-9. Retrieved 2 May 2009. Paris, Timothy J. (2003). Britain, the Hashemites and Arab Rule: The Sherifian Solution. Routledge. ISBN 978-1-135-77191-1. Quigley, John B. (1990). Palestine and Israel: A Challenge to Justice. Duke University Press. Quigley, John (6 September 2010). The Statehood of Palestine: International Law in the Middle East Conflict. Cambridge University Press. ISBN 978-1-139-49124-2. Wright, Quincy (1930). Mandates Under the League of Nations. University of Chicago Press. OCLC 562719723. Frischwasser-Ra'anan, Heinz Felix (1955). The Frontiers of a Nation: A Re-examination of the Forces which Created the Palestine Mandate and Determined Its Territorial Shape. Batchworth Press. ISBN 978-0-598-93542-7. Sicker, Martin (1999). Reshaping Palestine: From Muhammad Ali to the British Mandate, 1831-1922. Greenwood Publishing Group. ISBN 978-0-275-96639-3. Stoyanovsky, Jacob (1928). The mandate for Palestine: a contribution to the theory and practice of international mandates. Longmans, Green. Sykes, Christopher (1973). "Crossroads to Israel". Indiana University Press. ISBN 0-253-20165-9. Retrieved 4 June 2015. Wilson, Mary Christina (1990). King Abdullah, Britain and the Making of Jordan. Cambridge University Press. ISBN 978-0-521-39987-6. Wright, Esmond (1951). "Abdallah's Jordan: 1947-1951". Middle East Journal. 5: 439–460. Zander, Walter (1973). "On the Settlement of Disputes About the Christian Holy Places". Israel Law Review. 8 (3): 331–366. doi:10.1017/S0021223700004258. Büssow, Johann (2011). Hamidian Palestine: Politics and Society in the District of Jerusalem 1872–1908. BRILL. ISBN 978-90-04-20569-7. * Reid, Walter (1 September 2011). Empire of Sand: How Britain Made the Middle East. Birlinn. ISBN 978-0-85790-080-7. Zieger, Robert H. (2001). America's Great War: World War I and the American Experience. Rowman & Littlefield. ISBN 978-0-8476-9645-1. Lebow, Richard Ned (1968). "Woodrow Wilson and the Balfour Declaration". The Journal of Modern History. 40 (4): 501–523. doi:10.1086/240237. JSTOR 1878450. Caplan, Neil (2011). The Israel-Palestine Conflict: Contested Histories. John Wiley & Sons. ISBN 978-1-4443-5786-8. Gelvin, James (2014) . The Israel-Palestine Conflict: One Hundred Years of War (3 ed.). Cambridge University Press. ISBN 978-0-521-85289-0. Friedman, Isaiah (1973). The Question of Palestine: British-Jewish-Arab Relations, 1914–1918. Transaction Publishers. ISBN 978-1-4128-3868-9. Friedman, Isaiah (2011). British Pan-Arab Policy, 1915-1922. Transaction Publishers. ISBN 978-1-4128-1514-7. Renton, James (2016). "Flawed Foundations: The Balfour Declaration and the Palestine Mandate". In Miller, Rory (ed.). Britain, Palestine and Empire: The Mandate Years. Routledge. pp. 15–37. ISBN 978-1-317-17233-8. Schneer, Jonathan (2010). The Balfour Declaration: The Origins of the Arab-Israeli Conflict. Random House. ISBN 978-1-4000-6532-5. Huneidi, Sahar (2001). A Broken Trust: Sir Herbert Samuel, Zionism and the Palestinians. I.B.Tauris. p. 84. ISBN 978-1-86064-172-5. Beshara, Adel (27 April 2012). The Origins of Syrian Nationhood: Histories, Pioneers and Identity. Taylor & Francis. ISBN 978-1-136-72450-3. Hurewitz, J. C. (1 June 1979). The Middle East and North Africa in World Politics: A Documentary Record – British-French Supremacy, 1914–1945. Yale University Press. ISBN 978-0-300-02203-2. Wasserstein, Bernard (2008). Israel and Palestine: Why They Fight and Can They Stop?. Profile Books. ISBN 978-1-84668-092-2. Bentwich, Norman (1932). England in Palestine. K. Paul, Trench, Trubner & Company Limited. Bentwich, Norman (1929). "The Mandate for Transjordan". British Year Book of International Law. Humphrey Sumner Milford. 10: 212. Weizmann, Chaim (1949). Trial and Error, The Autobiography of Chaim Weizmann. Jewish Publication Society of America. OCLC 830295337. Woodward, Ernest Llewellyn (1952). Documents on British Foreign Policy, 1919-1939, First series, Volume IV. H.M. Stationery Office. Woodward, Ernest Llewellyn (1963). Documents on British Foreign Policy, 1919-1939, First series, Volume XIII. H.M. Stationery Office. Zionist Organization (1922). Report of the Twelfth Zionist Congress: Held at Carlsbad, September 1st to 14th 1921. Central Office of the Zionist Organization. ; original German transcript at Stenographisches Protokoll der Verhandlungen des 12. Zionisten-Kongresses in Karlsbad vom 1. bis 14. September 1921 [Proceedings of the 12th Zionist Congress September 1 to 14, 1921 in Karlsbad (Karlovy Vary)]. sammlungen.ub.uni-frankfurt.de (in German). Berlin: Jüdischer Verlag. 1922. p. 279. ZDB 2176334-3. Retrieved 23 June 2017. Wikimedia Commons has media related to British Mandate of Palestine.